Your resume is often the first contact you have with an employer. This first impression can either increase or decrease your chances of obtaining employment in the position you are applying for. The worst resume mistakes are most often the simplest to make, the most overlooked by the writer and extremely hard to improve once an employer has seen them. However, you can avoid these mistakes by knowing which mistakes to be watchful for. 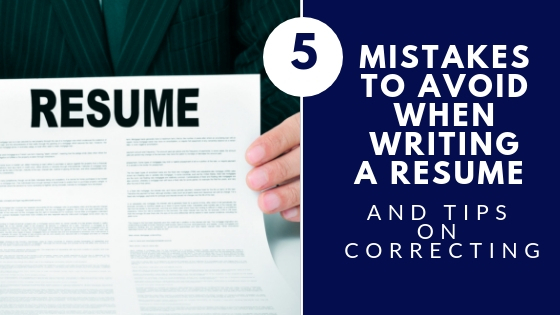 Have a look at these top 5 mistakes to avoid when either creating or updating your resume, followed by the tips on correcting these mistakes if they are made. This may seem to be the most obvious mistake, but it is also the most important mistake to avoid. If your resume is not grammatically perfect or has typo’s in it, employers will most definitely read between the lines or come to some not intended conclusions about you. The employer may not keep your resume for further recruitment steps. Employers might think, “This person obviously can’t write” or “This person obviously doesn’t care”. Tip: Remember to check your spelling and grammar before handing out your resumes. Computers can make mistakes too. Remember to ask someone you trust to proofread your resume for you, ask for their advice and heed their advice. B: Greeted clients/potential clients, recruit clients, transferred calls, assisted clients with their employment needs and assisted staff with their work. Tip: Both of these examples above describe the same person. However in example B there is more detail describing what the person has done in order to grab an employer’s attention. The more specific you can be the better chance you have at moving on in the recruitment process and gaining employment. Tip: Keep in mind when writing your resume that employers want to feel special. When writing your resume, write it especially for them. Employers want to know how and why you would fit in the position you are applying for. Tell them what you are capable of doing for them and how you would be an asset to them. If your resume is margin to margin with text, has 5 different font sizes/styles or is handwritten on a piece of lined paper, the employer will not be able to read it effectively. The employer or the person you hand your resume to would then be more inclined to throw your resume in the recycle bin and move on to the next application. Tip: Your resume should always be typed. You should only have 1 font style and 2 different font sizes on your resume. The font sGaramonduld be Times New Roman or Garabond. It needs to be easy to read and look professional. The font size should be no bigger than 16 for your name and 12 for the rest of your resume. Keep in mind ‘hard on the eyes, revise’. Seeking professional help can be difficult sometimes. It is not always easy to admit one needs help when writing or revising a resume. If after handing out your resume to different employers, you still haven’t received a call for an interview; it’s time to seek some professional help. Tip: Come into Employment North. At Employment North we offer workshops on Resume Writing (among others) as well as staff to assist with your resume. If you feel you need more assistance with your employment needs, book an appointment with one of our employment counsellors. Don’t feel discouraged if you need a little help finding employment, we are here and happy to assist you with all your job search needs. Employment North has been very successful in filling placements for our company and we have always been impressed with the level of professionalism and high quality service that we receive each time we deal with your office.